Enrich your workout and make practice even more dynamic with a yoga sandbag. They're one of the most versatile yoga props, whether you want to relax or push yourself for a more intense workout. Sandbags help encourage your body into deeper poses and let you release resistance. They also provide stability to help you hold a difficult pose. While in Savasana or child's pose, sandbags can help ease tension in your muscles. They're ideal for all types of yoga, particularly Anusara, Iyengar and Restorative practices. Plus, sturdy handles mean they're easy to transport and position. 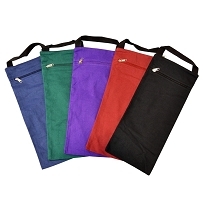 Yoga Direct offers a range of colours, and bags are unfilled so you can customise their weight. We also offer wholesale discount pricing if you're setting up a studio or buying in bulk.